When the IEEE introduced the 802.3ba Ethernet standard, this was in response to the increasing bandwidth demands facing data centers, paving the way for the introduction of 40Gb/s and 100Gb/s Ethernet operations. Believe it or not, the 40 Gigabit Ethernet era is already upon us. This text put together a brief overview of the current 40 Gigabit Ethernet optics types and form factors to aid in planning for future high-performance Ethernet needs. The IEEE 802.3ba introduced the 40 Gigabit and 100 Gigabit Ethernet standards in 2010. 802.3ba is the designation given to the higher speed Ethernet task force which completed its work to modify the 802.3 standard to support speeds higher than 10 Gbit/s. This was the first time two different Ethernet speeds were specified in a single standard. 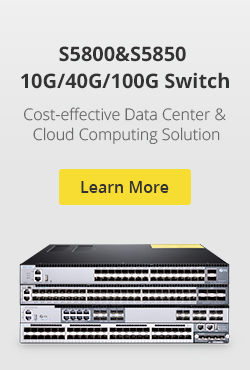 The table below gives detailed specifications for 40 Gigabit Ethernet standards. As with any new generation of technology, one design goal was to leverage as much existing technology as possible. By minimizing the number of new interfaces, the interfaces become less expensive and take advantage of volume production and simplicity. To meet this design goal, there are three media modules will be used in the first generation of 40 Gigabit Ethernet: QSFP, CXP and CFP. 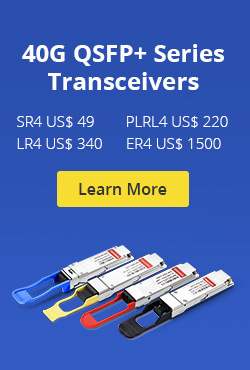 The Quad Small-Form-Factor Pluggable (QSFP) is similar in size to the CXP and provides four transmit and four receive lanes to support 40 Gigabit Ethernet applications for multimode fiber and copper today and may serve single-mode in the future. Another future role for the QSFP may be to serve 100 Gigabit Ethernet when lane rates increase to 25 Gbps. The CXP transceiver features 12 transmit and 12 receive 10-Gbps lanes to support one 100 Gigabit Ethernet port, or up to three 40 Gigabit Ethernet ports. 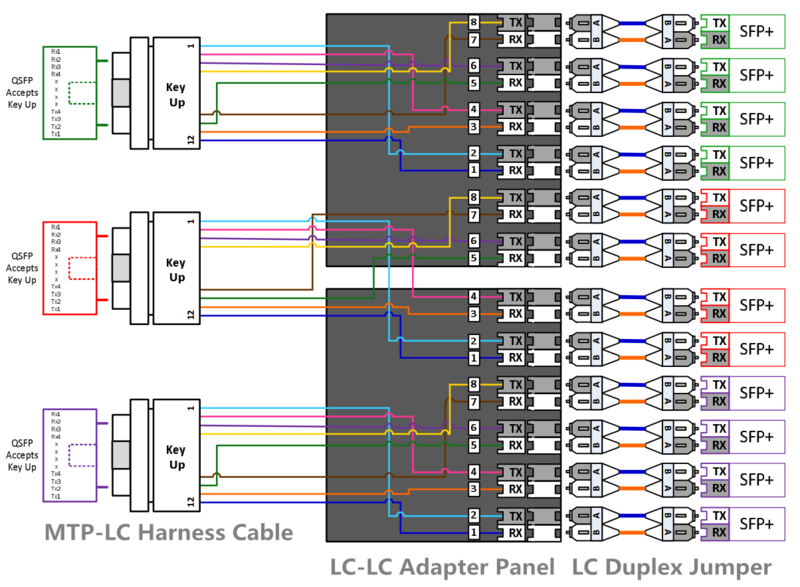 It can achieve rates up to 120 Gbps of pluggable data over 12 lanes in one assembly while enhanced-footprint connectors transmit signals over 10 lanes for up to 100 Gbps. The C Form-Factor Pluggable (CFP) is a new media module that was designed for longer-reach applications, with up to 24 watts of power dissipation. Its dense electrical connectors and integrated, riding heat sink enable a range of interfaces. This module is used for 40GBASE-SR4, 40GBASE-LR4. 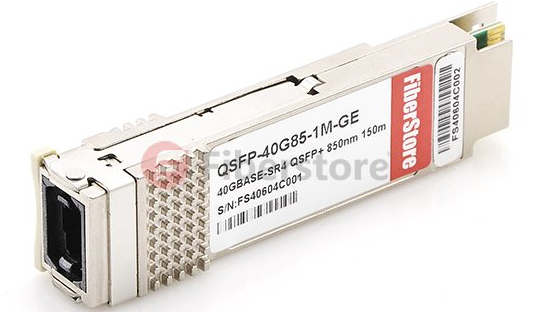 The most common 40GbE cable is the QSFP+ Cable. 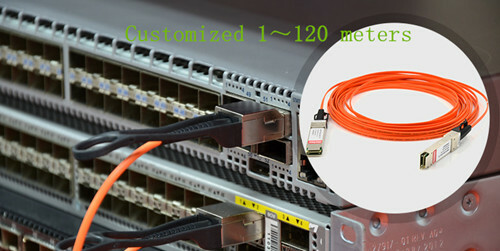 Such as QSFP direct attach copper cable (DAC) and QSFP active optical cable (AOC). Besides, the MPO/MTP cable is considered the best solution for 40GbE. 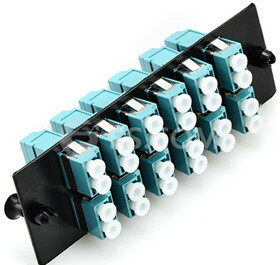 Since MPO/MTP connectors have either 12 fibres or 24 fibres array, which can allow data transmission across multiple fibres simultaneously. Transmitting 40 GbE over short distances of parallel coaxial copper cabling (also referred to as twinax cabling) is accomplished using a special cabling assembly with four lanes of coaxial cabling (eight pairs). Four pairs each transmit 10 Gbps in one direction and four transmit 10 Gbps in the other direction for a total data rate of 40 Gbps. 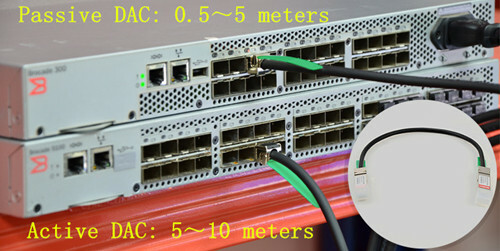 The two common DACs used in 40g Ethernet are QSFP to QSFP and QSFP to 4 SFP+ copper direct-attach cables. 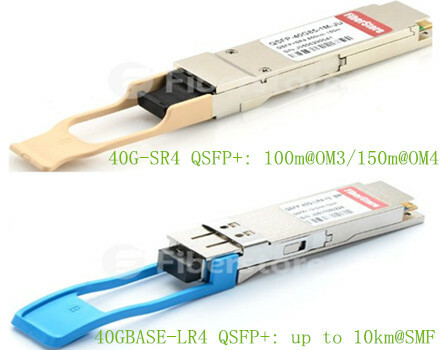 In the market, there are two common 40g fiber cable: QSFP to 4 SFP+ breakout AOC and QSFP to QSFP AOC. The former is a 4×10 Gb/s parallel active optical cable which transmits four separate streams of 10 Gb/s data over ribbon cables in a point-to-multipoint configuration. 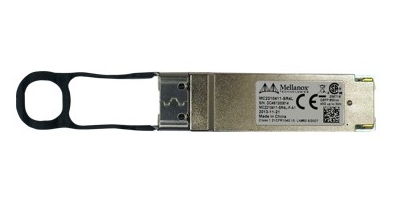 The cable contains a QSFP+ module on one end and four separate SFP+ modules at the other ends. The latter is a 40 Gb/s parallel active optical cable which transmits error-free parallel 4×10 Gb/s data over multimode fiber (MMF) ribbon cables. Current multi-mode optics standards for 40GbE optics use multiple 10Gbps lasers, simultaneously transmitting across multiple fiber strands to achieve high data rates. 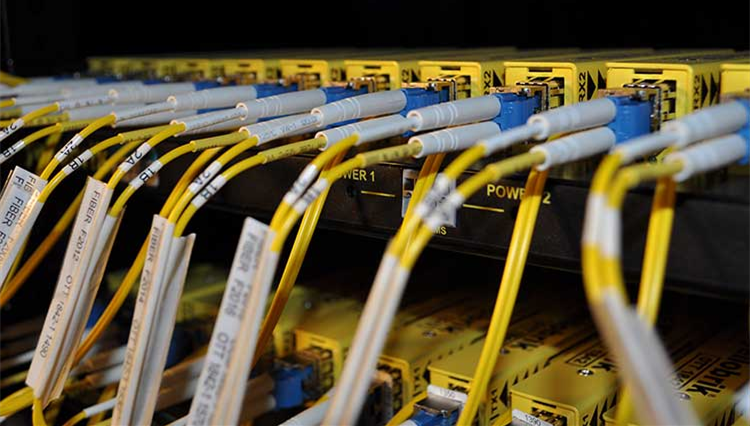 Because of the multi-lane nature of these optics, 40GbE multi-mode optics use a different style of fiber cabling, known as MPO or MTP cabling. As with 10GbE optics over multi-mode fiber, an OM3 or OM4 grade MMF is needed to be able to cover longer distances. 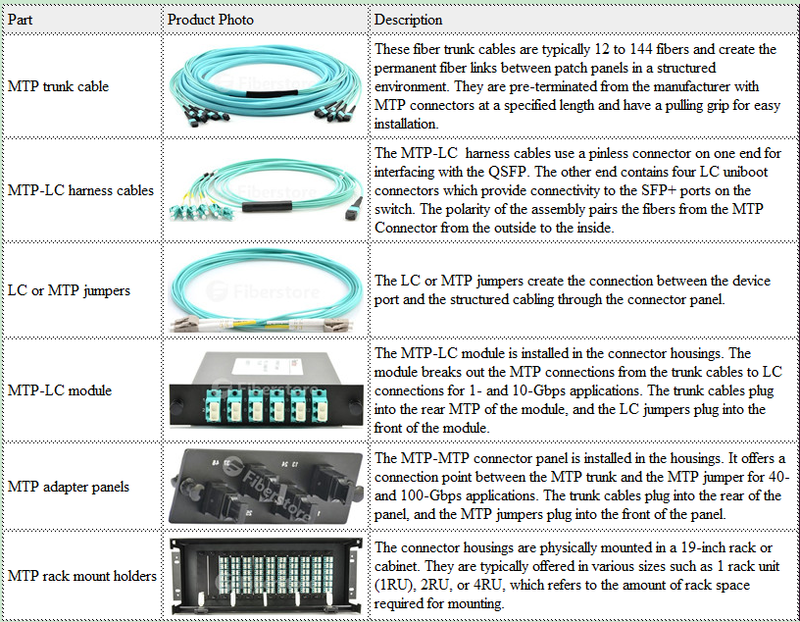 For 40g Ethernet, we can use 8 fibers MPO/MTP harness cables or 12 fibers MPO/MTP trunk cables. The former is to directly connect a QSFP port to other 4 SFP+ ports. The latter is to directly connect one QSFP port to another QSFP port. 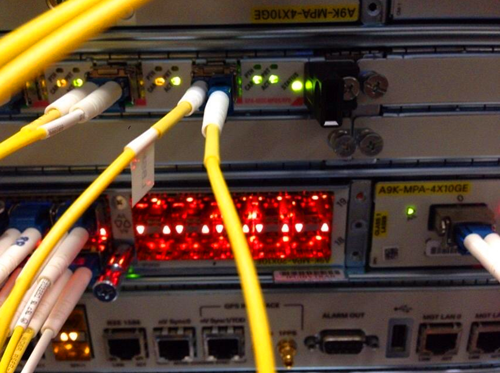 This entry was posted in QSFP+ Transceiver and tagged 40 Gigabit Ethernet, 40G QSFP+, 40GBASE-LR4, 40GBASE-SR4, CFP module, CXP Transceiver, MPO MTP Fiber on May 25, 2015 by Alice.Gui.